Because I’m super excited to tell you about them…all though I had a crazy hard time with the name! Sorry sometimes I can get a little ahead of myself. Ooops. Alright, so first things, first. Let’s talk about the rolls themselves. They are packed to the brim with veggies…PACKED. I’m talking carrots, bell peppers, cucumbers, cabbage, lettuce, etc. So many veggies, but yet so, so, good! There’s also some rather large handfuls of fresh cilantro and mint, plus sliced avocado and peanuts. I know, I know, that’s a lot. Like how did I get all of that to fit? I dunno, but I did, and I’m so glad! Which by the way, is really not as hard as you’d think. I will say that your first roll will probably not be your prettiest, but by the time you get around to wrapping up your third roll, you’ll have the hang of the whole tucking and rolling process. Promise it’s not scary… YOU CAN DO IT. 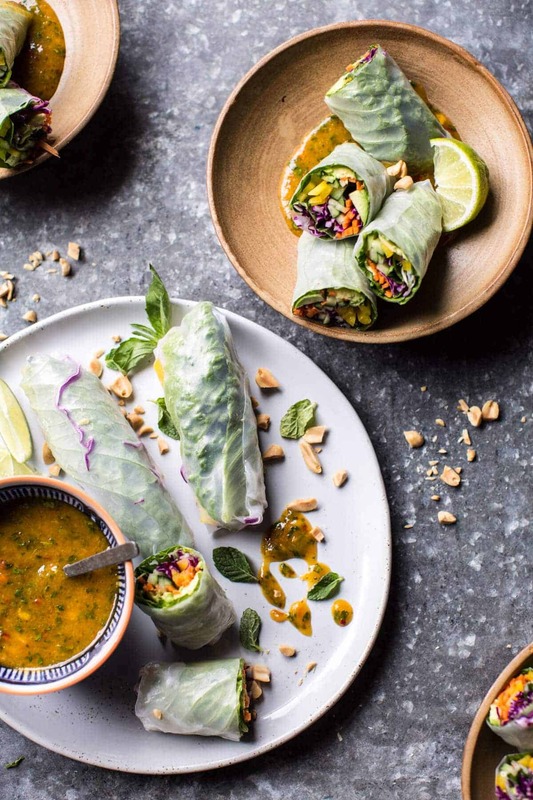 Then just place each prepared spring roll on a serving platter and cover with Reynolds Wrap® Aluminum Foil to keep the spring rolls from drying out. 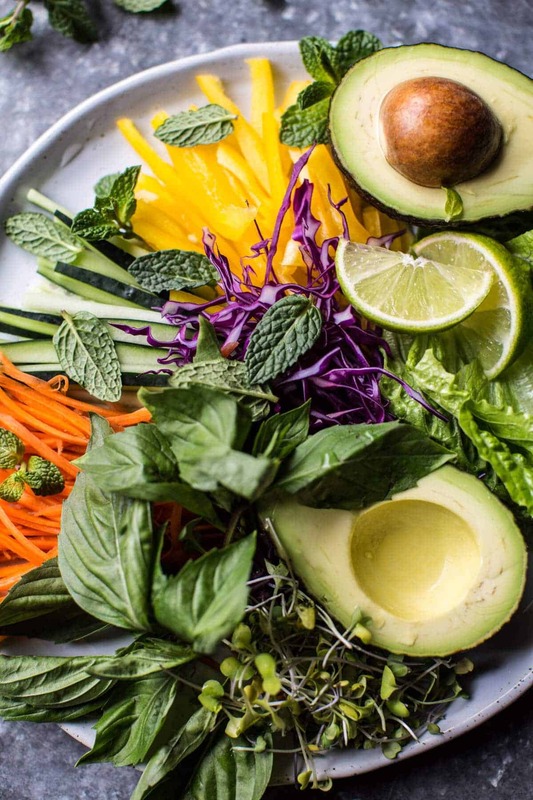 All that said, if you’re feeling super lazy (no judgement here…been there…wait I AM there…) you can just make spring roll salads/bowls and call it a day. 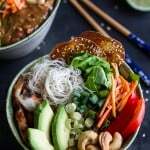 Just add all your veggies to a bowl, maybe add some rice noodles, cause that would be delish, and then add a very generous amount of that mango dipping sauce. Oh and um, that mango sauce? I will not lie, it is the sole reason I wanted to make spring rolls. I mean, sweet Thai chili sauce? mango? basil? lime? Seriously though, this sauce is EVERYTHING. I have been making it to eat with salads, Thai noodles, as a dipping sauce for coconut shrimp, like everything. It’s that good. You will LOVE it, or I hope you will, cause it’s one of my favorites and I am kind of excited about it. These rolls are perfect for snacks, lunch, light dinners and obviously as appetizers. Meaning all those upcoming summer parties. YUP, these NEED to be on the menu, duh. If you’d like to make these a little heartier, try adding grilled chicken or shrimp. If you need some more carbs? Thai rice noodles in for the win! 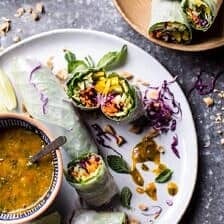 Veggie Spring Rolls with Thai Mango Dipping Sauce. Light and crunchy, sweet and spicy and basically filled with all good things. In a blender, combine all the ingredients except the basil and cilantro. Blend until smooth, add the basil + cilantro and pulse until chopped. Pour into a bowl, cover and place in the fridge until ready to serve. Create an assembly line of vegetables, so that they are all ready to go. I love using carrots, bell peppers, butter lettuce and fresh microgreens. Fill a shallow dish with warm water. Add each rice paper sheet, one at a time, for 5 to 10 seconds. Remove and place on a flat surface. 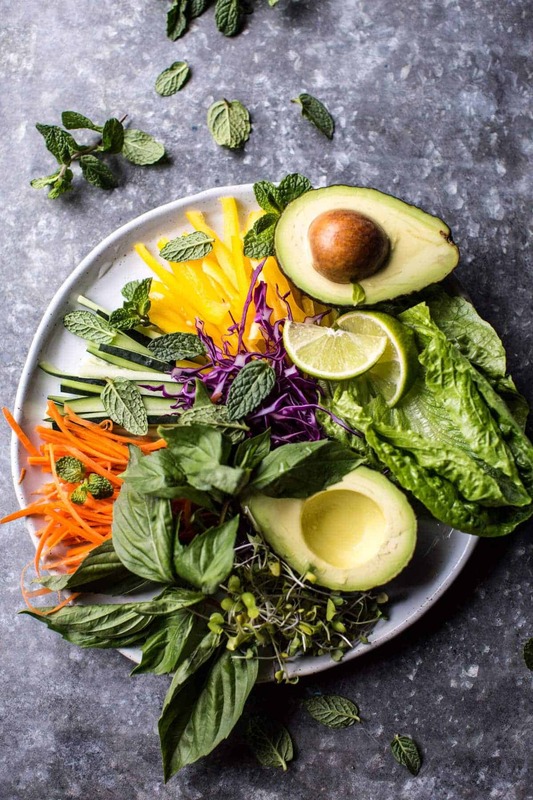 Towards one end of the rice wrapper, begin layering with 1-2 slices of avocado, and small handfuls of fresh cilantro + mint, and a handful of veggies. Sprinkle the veggies with salt + pepper. Fold both ends to the center and roll the sheet as tightly as you can without ripping. Place each prepared spring roll on a serving platter and cover with Reynolds Wrap® Aluminum Foil to keep the spring rolls from drying out. Continue with remaining ingredients, adding them to the platter as you work. Keep the spring rolls covered with foil at all times. Serve the spring rolls with the mango dipping sauce and chopped peanuts (if desired). 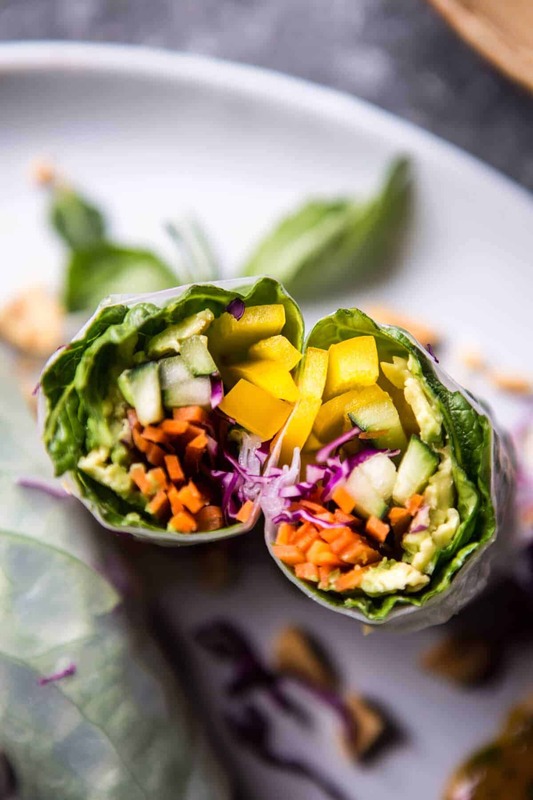 *To make for easing rolling, you can combine all your vegetables and herbs in a bowl, season with salt + pepper and then roll them in the spring roll wrappers as directed. 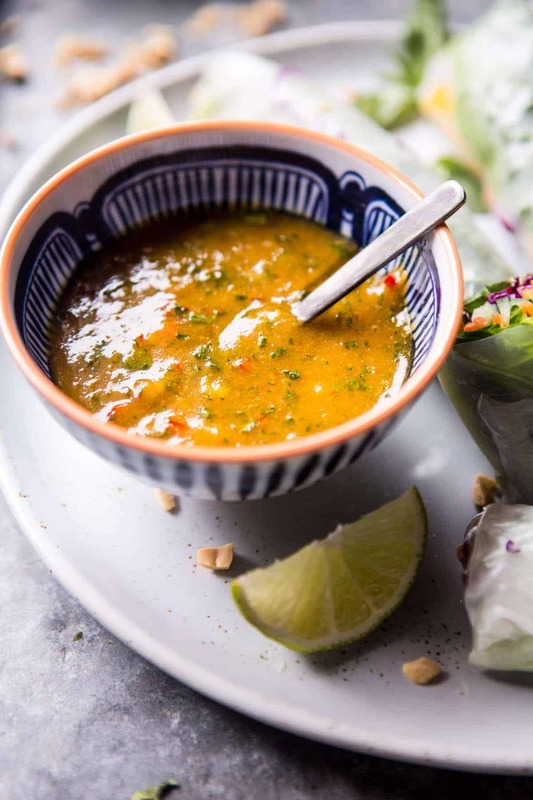 my go-to dipping sauce is normally peanut butter, chili garlic sauce, hoisin and a bit of water to thin, but yours sounds so much fresher! and i love that there’s mango involved. The mango is yummy! Hope you love it Heather! Beautiful! 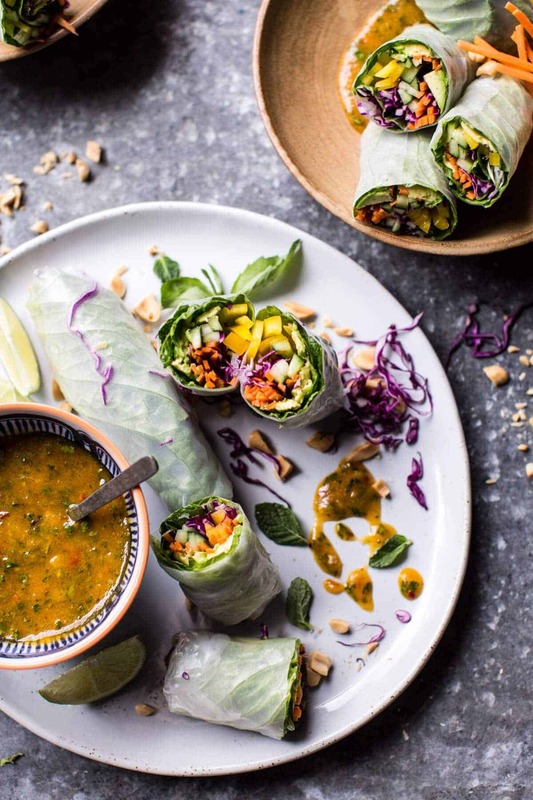 After many failed attempts we finally know how to make summer rolls that actually look good. Next up will be there for sure, the sauce sounds delish! This looks soooo delicious! Love all the different colors! Thank you Patricia! The spring roll bar is such a good idea!! I may just have to try that for my family! Glad you like the idea and hope you’re family likes it too! I am sure they will love it! Thanks Patricia! 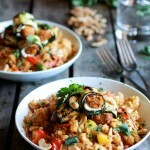 I could have this for lunch today and be quite happy about it!!! Thanks Miranda! Hope you love it! The colours and dipping sauce make me so, so happy. I am really craving some tofu with mango and mint now! Thank you Ksenia! I’m glad you enjoyed it, go for some tofu girl! This is what I need right now! Lots of goodies dipped in a mouth-watering sauce! Yes this hits the spot! I hope you enjoy it Julia! These spring rolls and the dipping sauce look amazing!! With the endless winter, I had almost forget the existence of spring/summer roll. Wow! That weather sounds crazy. I’m so happy that this is perfectly timed and I hope you enjoy them!! Thanks Erika! Oh My God ! That dipping sauce !!! Pure heaven ! I was just making it minutes ago for my lunch of tomorrow. Couldn’t help myself, I’ve had a few spoonful of just the sauce. YUMMY !!! AH!! So happy you liked it!! Thanks Erika! Oh my gosh! These spring rolls look sooo amazing. And your sweet Thai mango sauce sounds so incredible! I already know I’ll become obsessed with it! Thank you Ardith! I agree, they are so fun to make and eat! I hope you love the mango sauce as much as I did!! I just threw together a batch of this dipping sauce, but subbed raw honey + a big pinch of crushed red pepper for the sweet chili sauce. SO GOOD. I was resisting making another batch of spring rolls since today I shared a spring roll recipe w/peanut sauce today on my blog (twinning! ), but your mango sauce was calling to me! It’s just the perfect time for spring rolls!! Thank you Chelsea, I’m so happy you enjoyed them! Nice touch with the red pepper! THAT SAUCE! These rolls are packed with allllll the stuff I’m craving right now! So delicious! Thanks Isabelle! I’m glad you enjoyed it! Can I just say that I’m obsessed with your food photography? And your recipes are pretty amazing too! 😉 I never made spring rolls, so I guess this would be the perfect time to try them! Thank you so much Caroline! Yes definitely a perfect time to try them, they’re so delicious!! Besides chili sauce I had all the ingredients on hand, so at lunch time I walked straight in the kitchen and made your recipe! Thank you! The mango sauce is awesome. I substituted the chili sauce for honey and jalapeno. These look gorgeous! 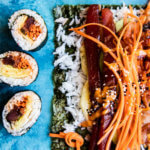 I love spring rolls, so I am excited to give these a try. I hope your presentation went well in New York! Thanks Susan! It went well!! Hey Katie!! I AM SO SORRY! Honestly, I kind of forgot about posting that recipe…things have been a little crazy so I too have just been buying mine at the store. 🙁 I will try and get this recipe all tested and read to go soon!! Sorry for the major delay!! Thank so much for reading daily, that is so AMAZING!! 🙂 Tieghan! Hi. 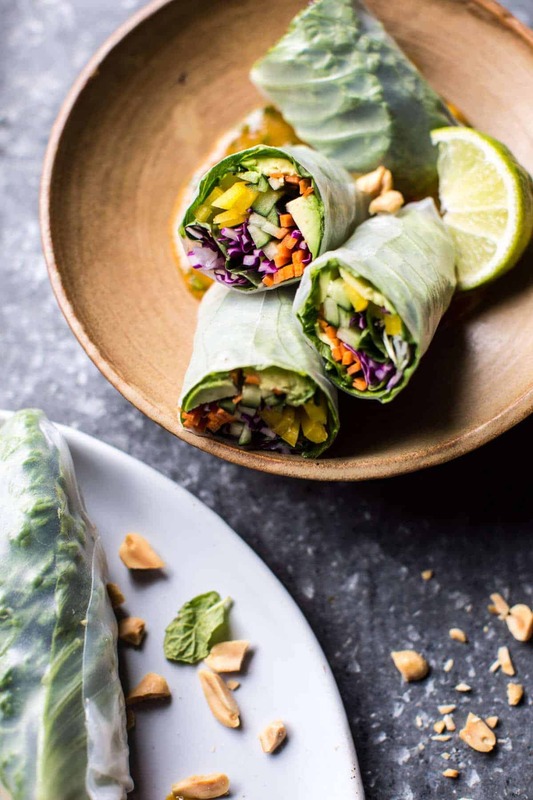 They look great, but…are the rolls pictured lined with cabbage leaves first? Help kinda confused? 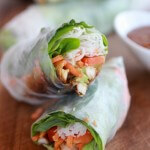 Spring rolls are the best, these look beyond fab. I’m all about that mango sauce! Thank you Laura!! So so so happy you liked the mango sauce!! Who said that being vegetarians don´t have fun? Look at that! It looks so yummy, so beautiful to see and so easy to make! This looks like a delicious way to load up on fruits & veggies! Definitely a great way!! Thanks so much Kari!! 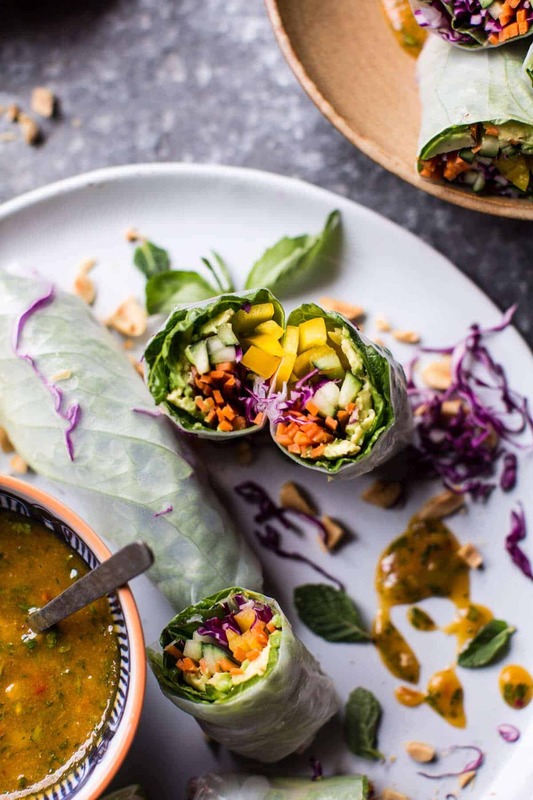 Spring rolls are STAPLES in Vietnamese cuisine! I LOVE that Thai sauce too. SO. FREAKING. TASTY. Thank you so much Cassie!! I am so happy you enjoyed them!! I notice you instruct to wrap with foil so they don’t dry out. Does that mean I can’t make these much in advance? Can I make the in the morning, maybe cover with a damp paper towel and foil and out in the fridge for 5 hours? I’m not trying to be the “I know better”- type of person, but it’s not a good idea to make spring rolls in advance and wrap them in foil. Did that once for school lunch and the rice paper became very mushy and fell apart very easily, because of the moisture. It was a tiny bit better with plastic wrap, but not that much. Oh no sorry! Did it not working making then in advance? How do you keep the rice wrappers from becoming rubbery? Sauce was delicious, but the consistency of the wrappers was not so good. Hey Betsy, i’m thinking you may be soaked the rice soaked the rice paper too long. That can lead to bad texture. Let Me know if you have questions. Very allergic to mango. What would be a good substitute or another sauce? Wondering how long they last in refrigerator…i would love to use them for my lunches through the week..if you have any idea about how long they last it would help out.. I have made overnight spring rolls for lunch a couple times, and they never turn out great. If you cover them with plastic wrap or aluminum foil they turn out to mushy, because of the excess moisture, and if you pack them in something dry like baking paper, they stick to the paper. It’s more like an instant eat thing, Penny ? Hey Penny!! To be honest, these are best eaten the day you make them. The papers can get a little soggy, but I have eaten leftovers a few days after making and they still taste great! Let me know if you have any questions. Thank you! Someone told me once that Summer Rolls are “fresh” and Spring Rolls are fried. This was in a Vietnamese restaurant, so not sure if it’s universal, but thought it was an interesting perspective! Hey Ahonui!! Yes, I have actually hear that as well, but I decided to leave my spring rolls un-fried to make them a bit healthier. Thank you! Hey Clare!! I like to use butter lettuce! 🙂 You can use the lettuce in place of the wrappers, that will be great! Please let me know if you have any other questions. I hope you love these spring rolls!